Fujian, with a tradition of lacquer art, is also one of China's modern lacquer painting hubs. There are so many overseas Chinese in FuJian, and they have so many touching stories. "Bright Moon and Red Candle" displays the scene of an old returned overseas Chinese meeting his first old wife who has waited him for her whole life in their hometown. With the bright moon outside in the sky, a red candle glittering in the room, the old couple hugs each other in silence. It is hard to tell whether it is sadness or happiness on their face. 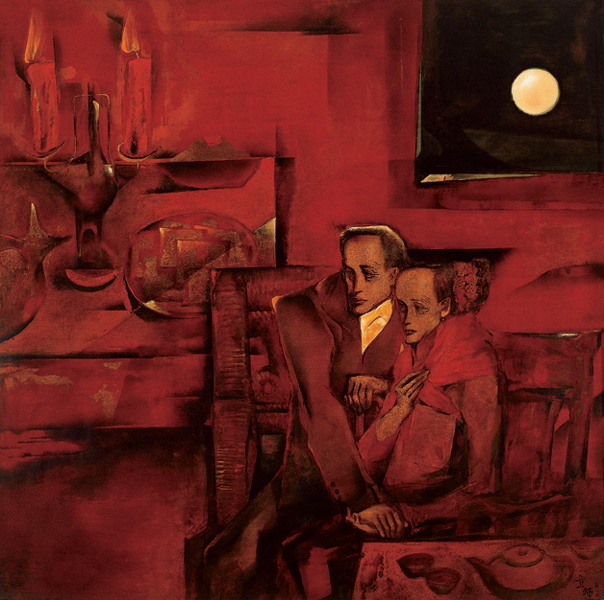 The large area of red color surrounded the old couple symbolizes consolatory because the couple finally reunited, and the picture is permeated with unspeakable melancholy, pain and helplessness. The mixture of sadness and happiness showed in this picture is quite touching, which made it elected as the Golden Award winner of the Seventh National Fine Art Exhibition. The artist's ingenious use of the lacquer effect fully represents the vividness of the black and red light, and the backlight of moon, which heightened the unique atmosphere and mood. This picture was painted by Chen Lide. He was born in Quanzhou, Fujian in 1948. He joined the research studio of Special Art Department of China Central Arts and Crafts Institute in 1982, and went to work as a painter in Quanzhou Painting Academy in Fujian in 1993.